Ballistic missiles in the hands of hostile states are one of the biggest threats today. Defensive systems include missiles, but detection radars are at least as important. The results of the Ballistic Missile Defense Sensor Integration Study (BMD SIS) were presented the day before yesterday. It shows how the Dutch SMART-L radars can work together with the SM-3 defense missiles of American 'shooters'. Missile attacks are getting faster and faster and are now flying high through the atmosphere. Behind the scenes, researchers are therefore working hard on the further development of radars. In turn, they can detect and track the missiles at a ever-increasing distances. The Royal Netherlands Navy will soon be using new radars on its air defense and command frigates (LCF): the SMART-L ELR (extended long range) radar. The Air Force will also receive two of these systems, replacing the current air defense radars at Nieuw Milligen and Wier. 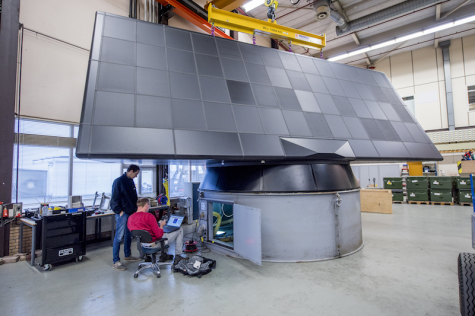 The Dutch-US study focused on integrating the SMART-L ELR radar into NATO missile defense architecture. This search, tracking and reporting capability must make it possible to destroy incoming ballistic missiles high in the atmosphere. The study results have now been incorporated into the software of the LCF Zr.Ms. De Ruyter. Rear Admiral Tom Druggan of the Missile Defense Agency presented the report at the defense ministry in The Hague to the Director of Plans, Major General Eric Schevenhoven. Druggan emphasized the importance of this collaboration and was impressed by the international technical commitment: "Even for countries that are engaged in missile defense at this high level, maritime ballistic missile defense is a major technical challenge, but it is also a crucial combat capability." Commander Fred Douglas is one of those involved on behalf of Defense: "You have to see it as a bullet that you shoot with another bullet from the air." The Netherlands is a European leader in radar and anti-ballistic missile technology. This leading role became visible during the At Sea Demonstration 2015 and Formidable Shield 2017, when Dutch air defense and command frigates (LCF) detected and tracked ballistic missiles with their SMART-L radar. With that targeting information, American ships then destroyed the incoming missiles.